In support of our mission, CSFI facilitated a Mock Officer Selection Board this past weekend in support of a CSFI staff member who is aspiring to join the military as a commissioned officer. This is an ongoing non-profit effort with the intent of preparing candidates who will be facing a military board to not only succeed but to excel. CSFI would like to thank our Mock Officer Selection Board team for their recent participation: Paul de Souza CSFI Founder, Anthony Guess-Johnson CSFI Senior Instructor, LtCol Pete Schiefelbein – US Marine Corps DoD Liaison to Cyber Security Forum Initiative – Marine Communication Officer, and Norman R. Hayes Rear Admiral (ret. ), US Navy Former Director of the Intelligence Headquarters, EUCOM (J-2) CSFI Advisory Board of Directors. Volunteer today to become part of our CSFI Red Cell Division (RCD). RCD members will support the CSFI mission by engaging in penetration testing technologies as appropriate, working together with our CSFI Cyber Spartans/CSFI Certified Instructors in the development of training environments such as cyber ranges, and by providing feedback on CSFI projects. The CSFI Red Cell Division is organized in groups of 14 members each. IE: OpFor-1 and so forth. Full name: CSFI RCD OpFor-1. NOTE: DEF CON Black Badge Holders and US Cyberspace Operations community are encouraged to apply. Interested parties, please send your resume in TEXT format (no Word or .pdf files) to contact@csfi.us. MITRE partners with the government, applying systems engineering and advanced technology to address issues of critical national importance. One public interest company, working with industry and academia to advance and apply science, technology, systems engineering, and strategy, enabling government and the private sector to make better decisions and implement solutions to complex challenges of national and global significance. CSFI supports MITRE and their mission for a stronger cyber defense national security posture. CSFI would like to thank the amazing technical and logistical support provided by MITRE to make this training a successful experience! Special thanks to Tim Watt and Adrian Garcia from MITRE, to Gia Foschi, Matthew Pavliv, Kristina Patten and the team from Global Knowledge, and to all CSFI sponsors and supporters who contribute to help CSFI fulfill its mission. 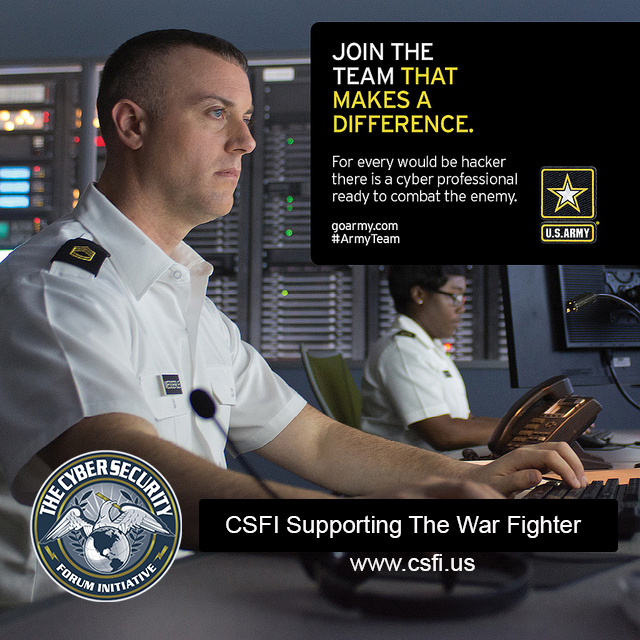 Our amazing CSFI Instructors, CSFI Cyber Spartans, CSFI Advisory Board of Directors, Deep Node, and the DoD are equally recognized. Certified CSFI Instructors: Anthony Guess-Johnson, Christine de Souza, and Ed Peace. All star cyber ops team! USAF Cyber Warfare Operations Officer de Souza volunteering from the 175th Cyberspace Operations Group training the students on the PBED process. Students plan for cyberspace operations following military doctrine. Great ICWOD exercise. Christine de Souza leads CSFI CTF’s C2.